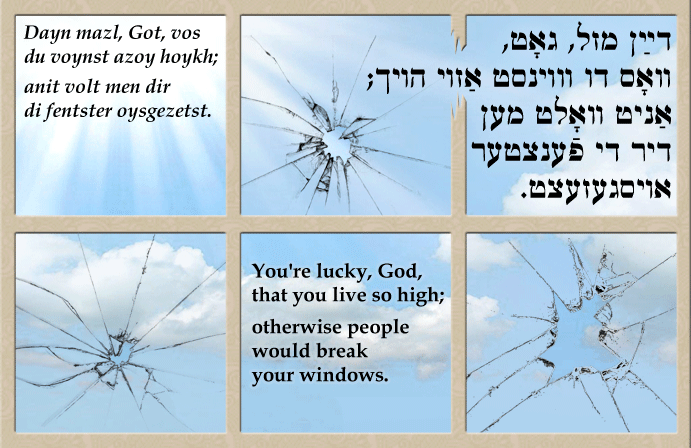 Yiddish Wit: You're lucky, God, that you live so high; otherwise people would break your windows. דײַן מזל, גאָט, וואָס דו וווינסט אַזוי הויך; אַניט וואָלט מען דיר די פֿענצטער אויסגעזעצט. Dayn mazl, Got, vos du voynst azoy hoykh; anit volt men dir di fentster oysgezetst. You're lucky, God, that you live so high; otherwise people would break your windows. Az got zol voynen af der erd‫,‬ voltn im di mentshn di fentster oysgeshlogn. If God lived on earth, people would knock his windows out. "Ato bokhartonu mikol hoamim"—vos hostu gevolt hobn fun yidn? "Thou hast chosen us from among the nations"—why did you have to pick on the Jews? God lives and we suffer!